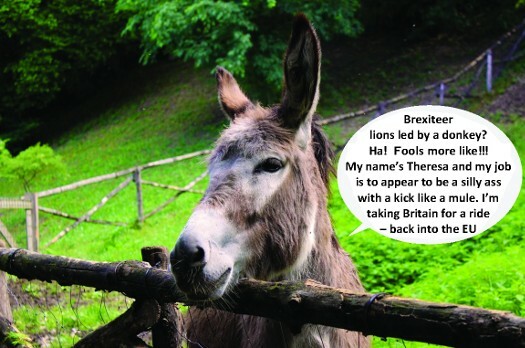 The British Gazette » Brexit: Can they really be THAT stupid? Above, another – EDITED – image sent by the generous patriot, Mr John Hart. Once again, the excellent Doctor Richard North applies his analysis and understanding of the issues to Brexit can comes up with the inevitable counsel of despair! NB: This is NOT a criticism but an ENDORSEMENT of same! It is famously said that a picture paints a thousand words. Well in this case it is a picture and forty one words that does the job! What Doctor North describes is a situation where incompetence appears to reign supreme! #2: We are being duped! That we are the paying audience to “un grand coup de théâtre” at the Palace of Westminster! Of course, for the scam to be successful the perpetrators need dupes! These sadly are in plentiful number and are to be found in the Tory party and of course, UKIP! It appears increasingly likely that Kippers will never know what a “train crash Brexit” is like as the UK will not experience it! For them the concept of a hard Brexit with the UK leaving the EU without a deal and succeeding on the fabled “WTO terms” will be the Shangri-La, somewhere over the rainbow! The nirvana where dreams really do come true! Reality unfortunately will be that the UK will be told to enact a second referendum and the voters will vote to remain. As we have said before!